Ever since the cell phone was invented there has always been a trend to follow and the competition when someone strikes gold. At first there was the race for color, then the RAZR came along and manufacturers scrambled to develop the technologies in order to diminish the size and weight of the units. Now often diminutive, phones have transformed into more and more complicated devices, trying to become mobile computers, assistants, cameras and multimedia players. Now it is 2008, and the ”I want it all and I want it now” trend in the phone industry is more apparent than ever; simply having the best camera- or business phone is not good enough, they have to be both. The phones from the higher class are already attempting to be good not only in one area but to perform well in all possible aspects, becoming “all-in-one” devices. 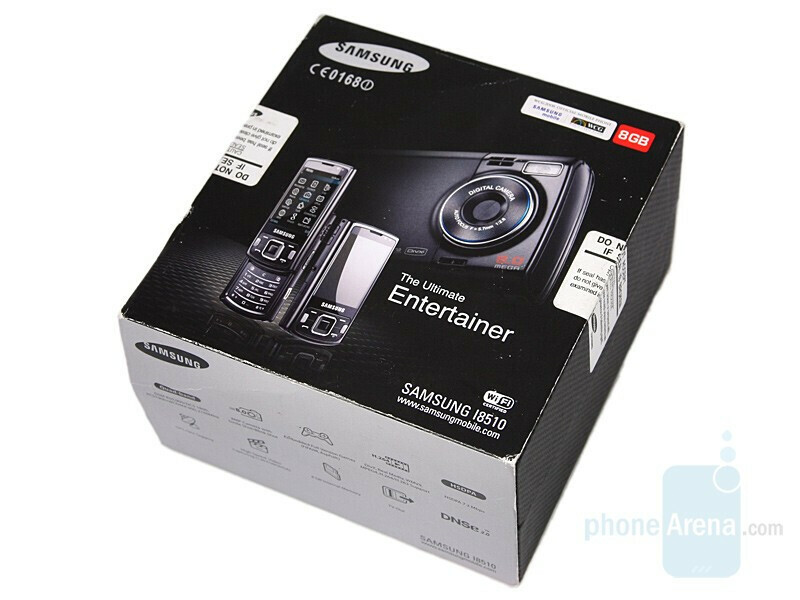 Samsung’s INNOV8 is a perfect representation of this mindset; their first 8 megapixel phone will not only attempts to conquer the photographic market but is also a smartphone and multimedia powerhouse. 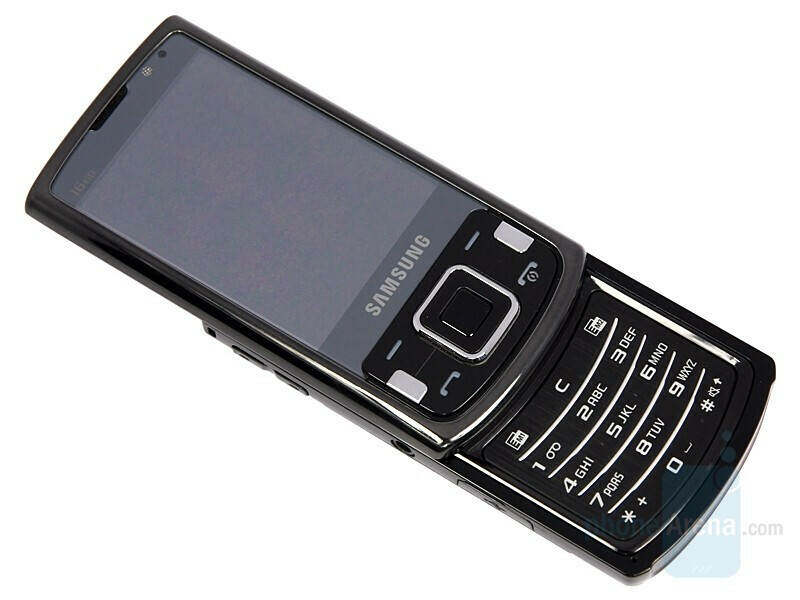 The INNOV8, technically the i8510, is the first converged device from Samsung, but the idea it carries reminds us of the G810, which is also a multifunctional phone based on Symbian S60. Design-wise, INNOV8 is the typical high-tech model. 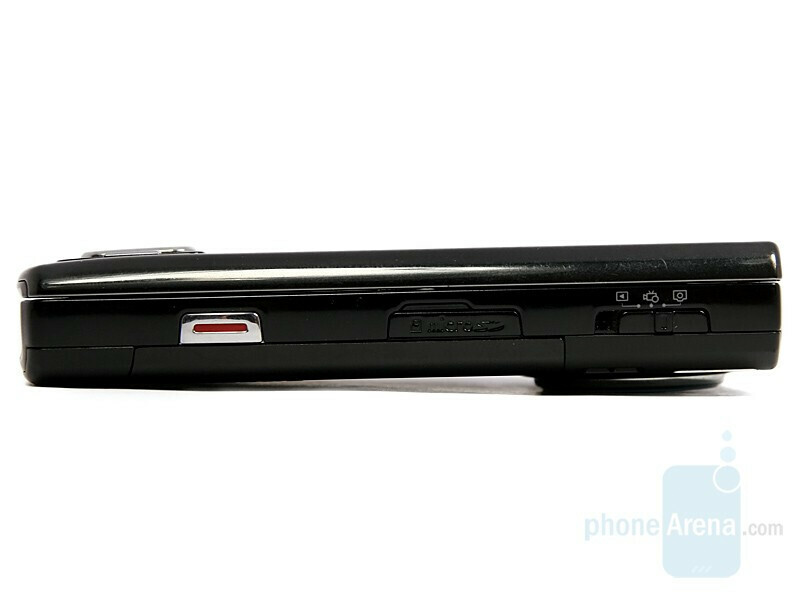 In contrast to the G810, the INNOV8 ditches the business look and reminds us that it’s a gadget with many options. The similar size reminds the user of rival models from Nokia to a certain extent, but in reality it has nothing in common with their design language. It does fit in a pocket but is definitely not one of the compact models. The small markings, indicating various specifications of the device (16GB, Wi-Fi, GPS, DivX) are noticeable here as well, so your friends gawking at new acquisition will know what it sports without you even telling them. You can compare the Samsung INNOV8 with many other phones using our Size Visualization Tool. The display is a generous 2.8” with a QVGA resolution of 240x320 pixels, though in high end models QVGA is becoming small. It looks good when viewing pictures and can be used in bright daylight but is not perfect. If the light falls directly on the screen, it transforms into a mirror, but if held at the right angle the phone can be used just fine. 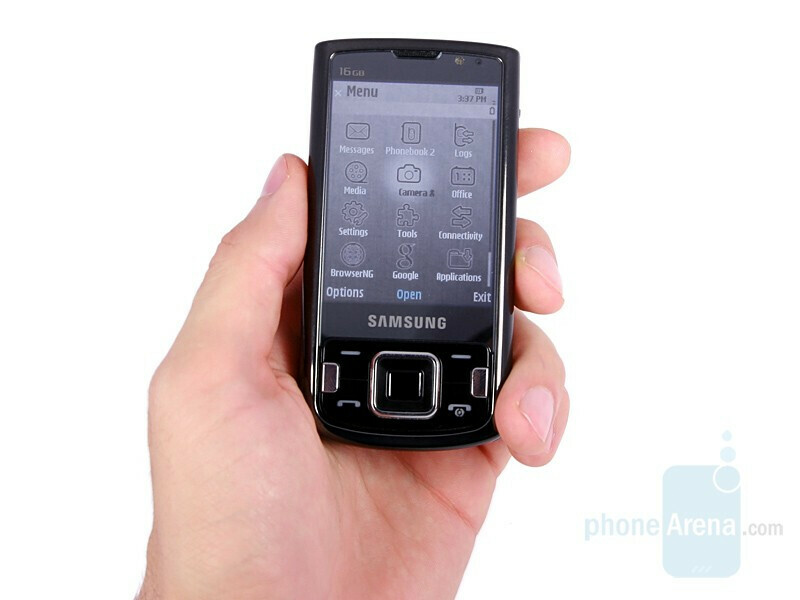 The large dimensions of the phone allow for many buttons without making them diminutive in size. The navigational keys are very good and are easily pressed with good tactile feedback. The silvery buttons are slightly protruding over the black ones and after some getting used to you’ll be able to operate both types at the same time without pressing the wrong one. We are still wondering why the d-pad and the silvery keys are not backlit, but as we mentioned before, you’ll be able to use them trouble free even in the even in the dark. 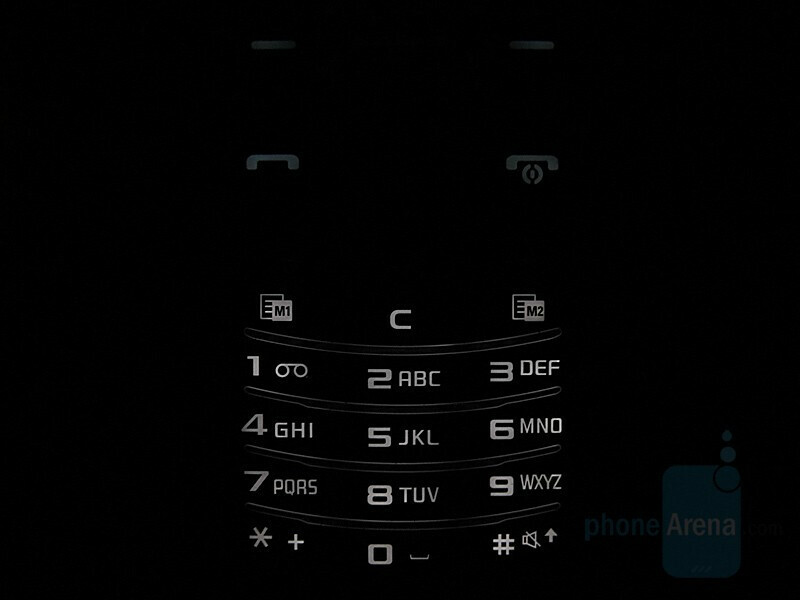 As with the i780 and OMNIA, the INNOV8 also has an optical mouse in the middle of the navigational cluster. It’s definitely more handy having it here compared to the touchscreen devices, but while we have no doubt that there will be people who use it, there will also be users like us that will deactivate it. It’s most useful for navigating in the browser (it can be used as a scroll in other places), but for us the pointer either doesn’t reach as far as we’d have liked it to in one move, or if we increased the sensitivity (there are 10 levels) it’s too fast. Even if it was perfect, navigating with it wouldn’t have been much faster than with the D-pad which is why we prefer the 5-way button. Either way, we are happy that Samsung has given us the option to use this alternative control method or not. 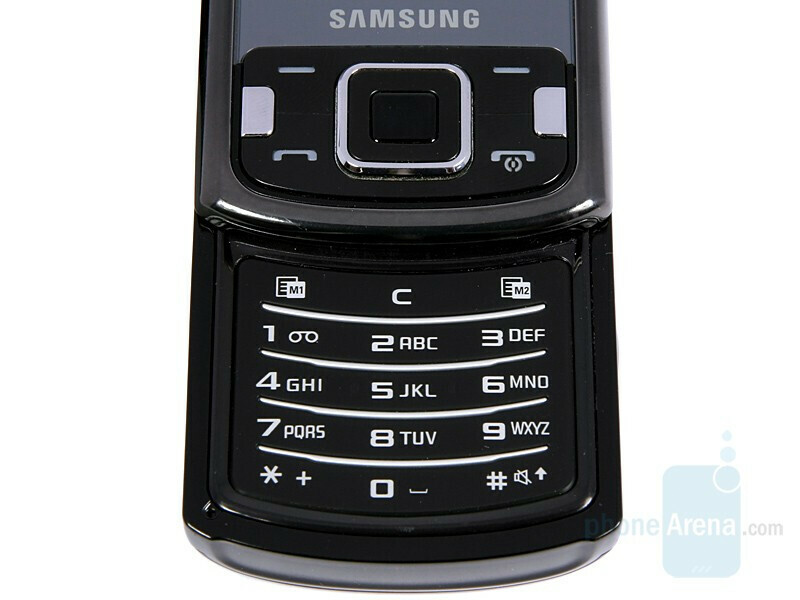 As it typical with a Samsung phone there is a row with shortcuts in the numeric keypad, which has its advantages and disadvantages. The good thing is that you get fast access to two applications of your choice, but the tradeoff is smaller numeric keypad buttons. The keyboard is not bad but due to the small size, the relief of the horizontal lines and the stroke of the buttons, we do not recommend it to the heavy texters. 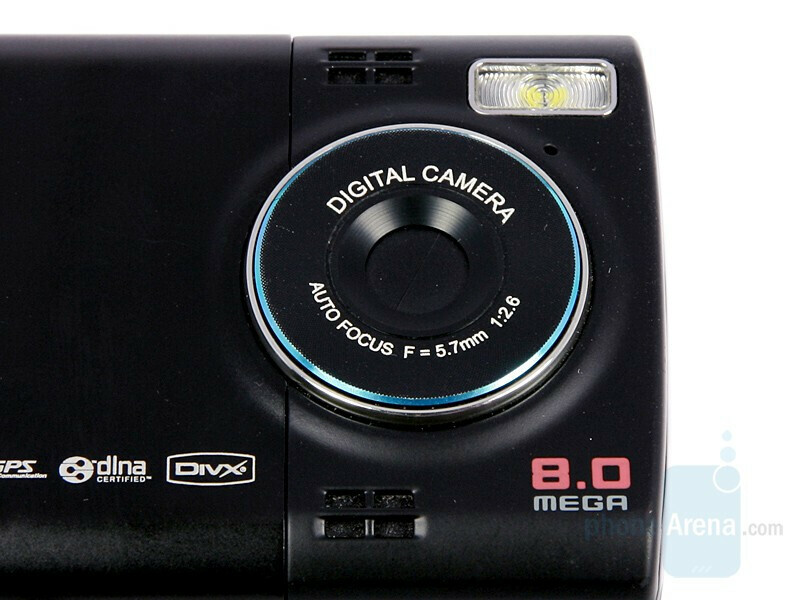 Similar to a number of other high-end cameraphones, the INNOV8 resembles a point and shoot when closed. On its back there is a clearly noticeable bulge for the lens and the flash. It’s nice that the protective lens cover opens automatically once the software is started, and in contrast to K850 there is no glass, which is easily scratched, making it pointless. 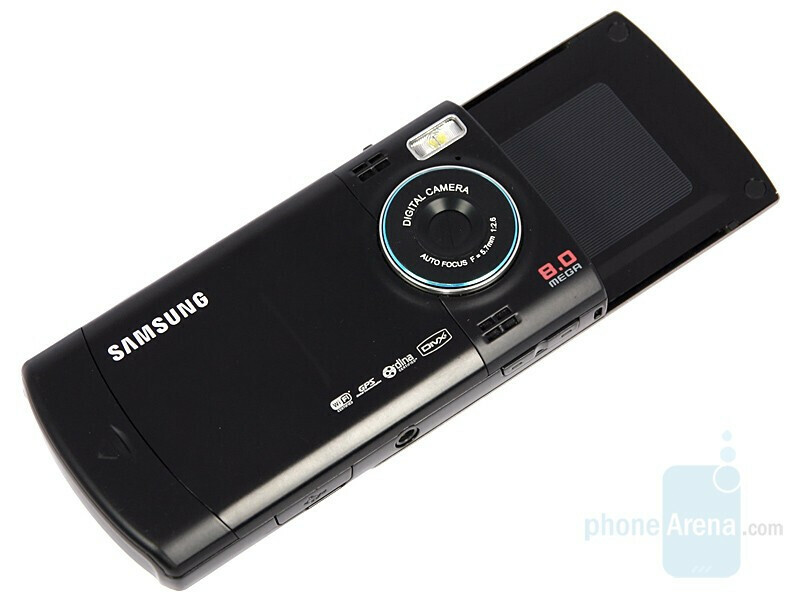 The right side (top one when used as a camera) houses a three-way switch for choosing the mode (picture, video or preview) and the convenient camera shutter. Samsung made a strange decision to put the volume rocker on the opposite side, which makes zooming in/out quite hard when holding the phone in a horizontal position. In portrait mode however, it easy to find by touch and is convenient to press. 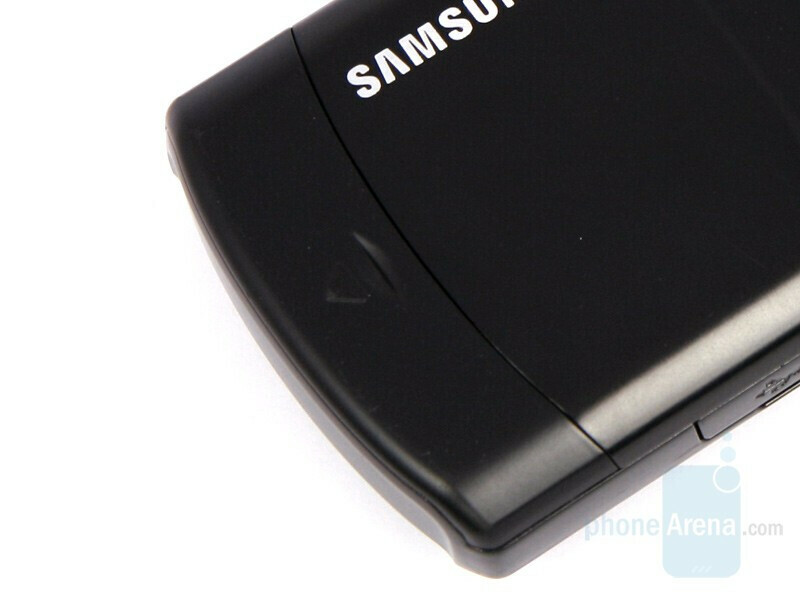 Similar to the Sony Ericsson model, we find an interesting solution for the battery lid; it has the standard position on the back, but in order to open it you don’t move the lid rather the unlocking mechanism below it instead. This element is very well done and we believe that it is a perfect solution for the back lid play, characteristic for most models of the recent past. Unfortunately, we are not so impressed with the overall quality of the phone. It doesn’t feel cheap but we wouldn’t classify it as a top-shelf model either. The slider moves nicely but like the prototype we used for our review the upper half is slightly jointed to the right when closed. This is not noticeable even on picture but you can feel it with your fingers. It could be that there is a problem with the mechanism, because when pressed with a finger, the top slider fits into place. Whatever the reason, it’s strange to see something like that in an expensive phone. How is that a "9" average? Anyone can see if you take the averages, it is a "8.25".. still, I know you aren't going just by averages, but other models have higher numbers overall, and still score the same..
the quality of camera is preet good. pretty clear and detailed. one website has reviewd to compare it to canon camera. actually, they are at same level. 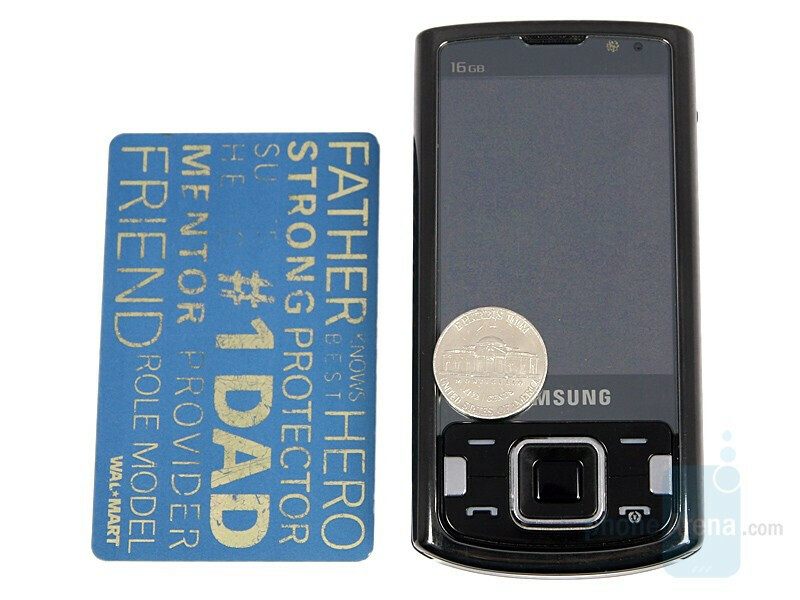 I was about to buy this one, but the photos do look disappointing (although other reviews I have seen had better pictures), maybe this specific handset had some problems. 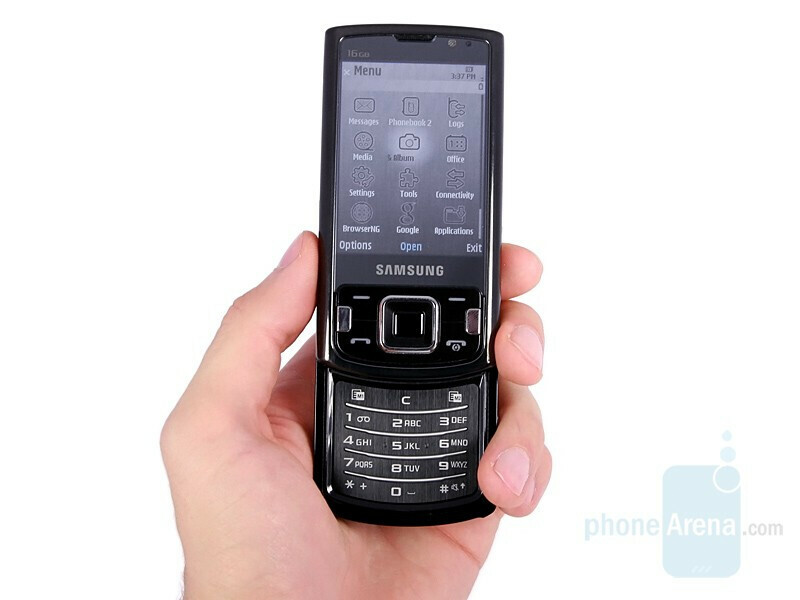 Maybe someone can help me, would this phone be able to play movies in avi format? The format plays perfectly on my computer with DivX Player, but will this phone play them also? Thank you. This was a silly review. I have this phone and can tell you the sound quality is the best between any phone I have had before. ex. 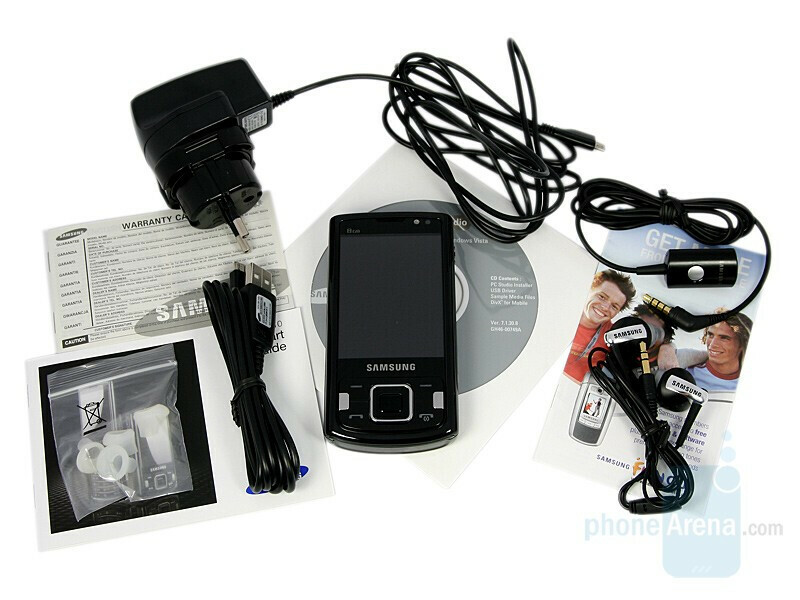 N95 8B, E90, E71 iphone 16GB. The phone design is awsome! only problem I have is software and firmware support from Samsung. No updates? Are you kidding me? Only one for style? This phone is a ten plus, it's beautiful. Another wishy washy review. The phone is good .. its not to good! Make up your mind!! PS I own one and it is a very good phone.